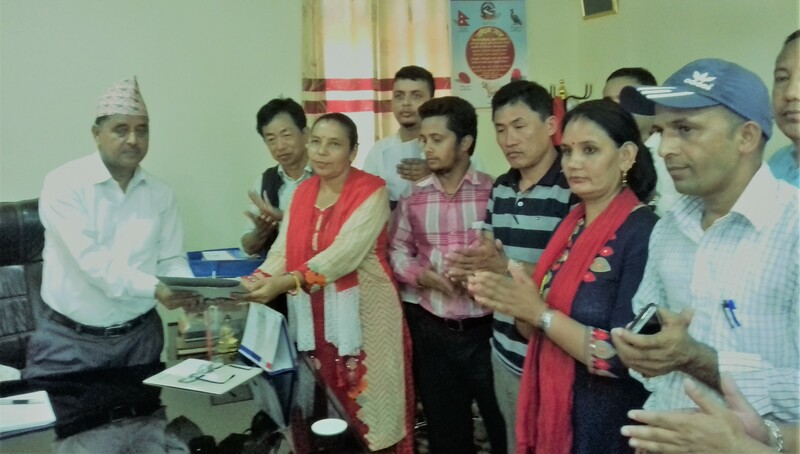 Demanding to declare provincial state number 1 as child marriage free, concerned stakeholders submitted the delegation paper to Mr. Jeevan Ghimire Social Development Minister of Province 1 on 20th July 2018 at Biratnagar, Morang. Sanjal, our network of active Civil Society Organizations has submitted the delegation paper to work towards the prevention of child marriage. Altogether nine organizations working in different districts of Province 1 submitted the delegation paper, mentioning that there is need of campaigning from governmental body itself, updating child marriage in school curriculum, facility of a helpline in each ward office, to seizing all the facilities of the people involved in child marriage, and by 2025 making Province 1 a child marriage free province. Mr. Ghimire, made a statement that the Ministry of Social Welfare needs to make a plan in order to prevent child marriage. He said that in Terai and Hilly regions of Nepal, child marriage has not stopped due to illiteracy, which allowed to manifest a cultural practice of it. He also said that child marriage is slowly decreasing and there is need of collaboration with concerned stakeholders and Province Ministries to achieve a child marriage free province with necessary actions. The organizations involved in submitting the delegation paper are ‘Sansthagat Bikas Sanjal’ Lalitpur, ‘Community Development Forum Nepal’ Morang, ‘Hilly Rural Development Organization Nepal’ (HRDON) Morang, ‘Gramin Mahila Jagaran Samuha’ Okhaldhunga, ‘Kotagadhi Sikhar Samaj’ Okhaldhunga, ‘ ‘Group of Helping Hands’ (SAHAS), ‘LikhuDemba Community Development Forum’ Okhaldhunga, ‘Chandra Jyoti Integrated rural Development Society Dhading’ and ‘Community Development Society’ Ramechhap. (1) Nepal has the third highest rate of child marriage in all over Asia, right after Bangladesh and India. (1) Among young mothers (ages 10 to 19 years) there is a higher risk of eclampsia, puerperal endometritis, and systemic infections. (2) Unsafe abortions contribute to maternal mortality and lasting health problems. (3) Emotional, psychological and social needs of pregnant adolescent girls can be greater than those of other women. (4) Babies born to mothers under 20 years of age face higher risks of low birth weight, preterm delivery, and severe neonatal conditions as well as long-term potential effects (WHO 2018).